Last month in St. Louis, Gata Kamsky the second highest rated US player (2808), won the 2011 US Championship title and a $42,000 prize. At the same location, Anna Zatonskih the highest rated woman (2506), won the Women’s US Championship and an $18,000 prize. If chess is a game where you mostly think and doesn’t use the body’s muscles like other sports, why are the highest rated women often rated 200-300 points lower, and get less money in prizes? In scholastic chess, such as at Tri-State Chess tournaments, girls and boys are equal. At the beginning of the summer we will celebrate a special birthday. It is not the birthday of your friend or relative. On July 4th, 2011 our country the United States of America will be 235 years old. Two hundred thirty five years ago, the leaders of our new country signed a very famous paper, the Declaration of Independence. Many of these “Founding Fathers” played chess including the most famous signer Benjamin Franklin, and the man who wrote the Declaration, Thomas Jefferson. Benjamin Franklin was an unusual man who was interested in many different subjects and was successful in almost everything he tried. He was a printer, publisher, businessman, politician, and a scientist who flew a kite in a famous experiment to prove lightning is electricity. To Queenside Castle or not to Queenside Castle? When kids first learn about castling they often are still weak overall players without too much experience. They are often told to castle as soon as possible and on the side of the King or to castle Kingside or “SHORT”. 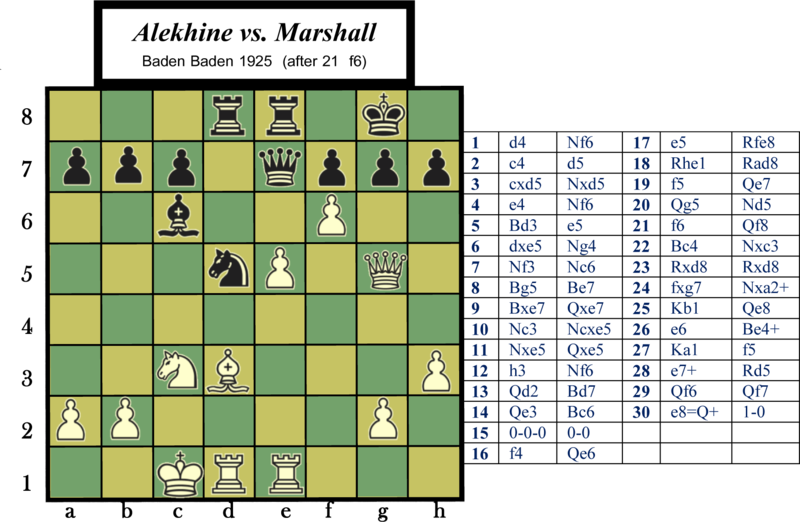 While a majority of the time this is sound advice for beginners, for players who either have played a few tournaments or are comfortable with all the pieces and basic rules an strategies of chess, when and how to castle can be very important and involves sometimes castling “LONG” or Queenside. 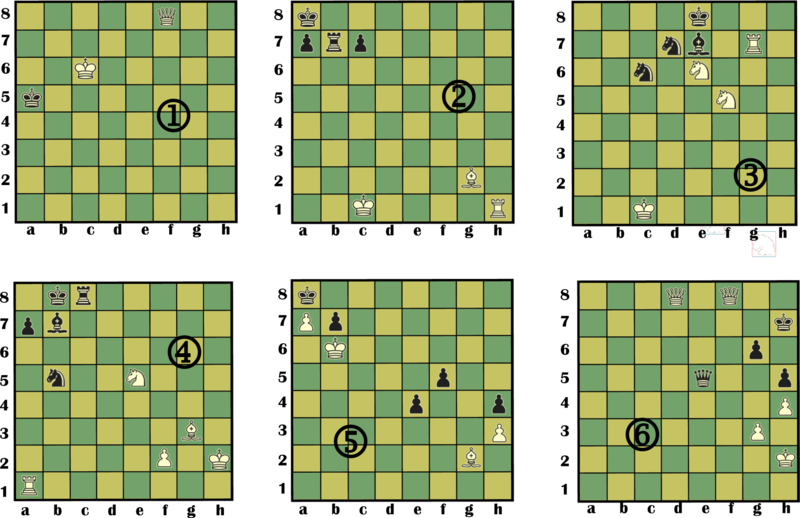 Overall, queenside castling can be risky as it puts the King closer to the center of the board. This risk must be looked at when thinking of the more special cases when queenside castling can work out. Castling is an important move that can give one an instant defensive advantage. 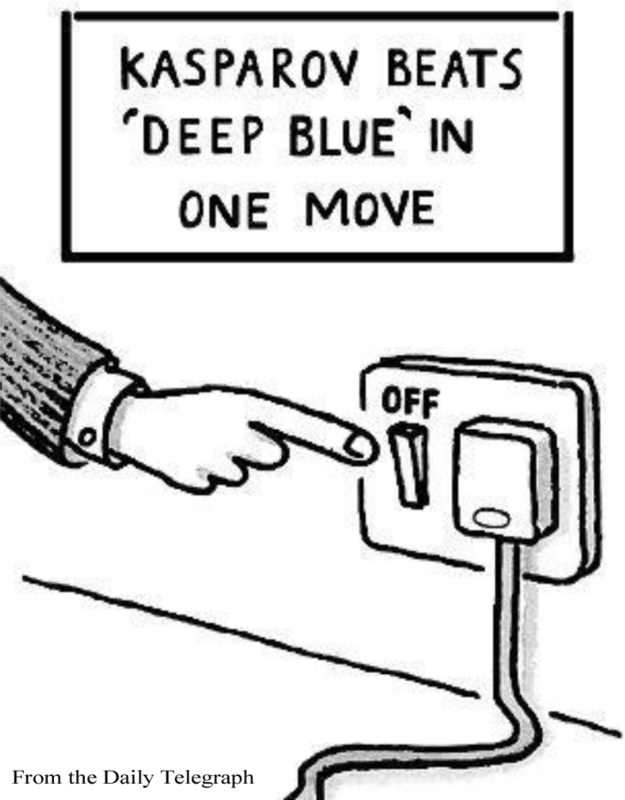 However there are times when you are prohibited from castling on one side of the board. If you move your king you cannot castle on either side. However if you move a rook, you cannot castle on the side that the rook is on. If you had to move your kingside rook you can only castle queenside. You also cannot castle into check, out of check, or through a check. If you have any of these situations on the kingside of the board you can probably only castle queenside. Though Queenside castling is often harder (You must take out another piece (the queen) to clear the way between the King and the Rook), its final position leaves the rook with whom you castled without any pieces in front of it, which can be a strong attacking position. 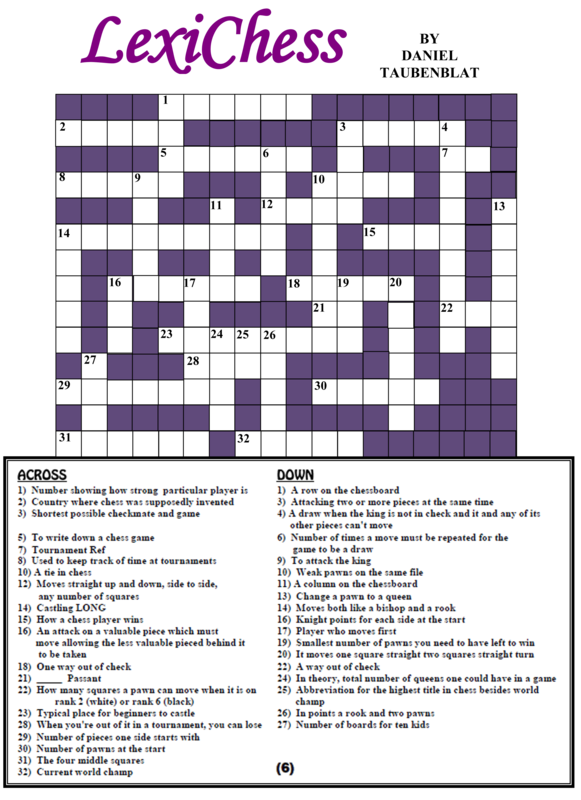 As shown on the right, this can result sometimes in the rook controlling the whole “d” file. If this strengthens your position, you should castle queenside. Franklin’s friend and one of his most challenging chessboard rivals was Thomas Jefferson, who wrote the Declaration of Independence and later on became the third US president. Jefferson loved to play chess and owned several books on chess. Recently, at Jefferson’s home Monticello, which he designed and built, archeologists poking through Jefferson’s garbage found two small round balls, each about the size of two marbles. 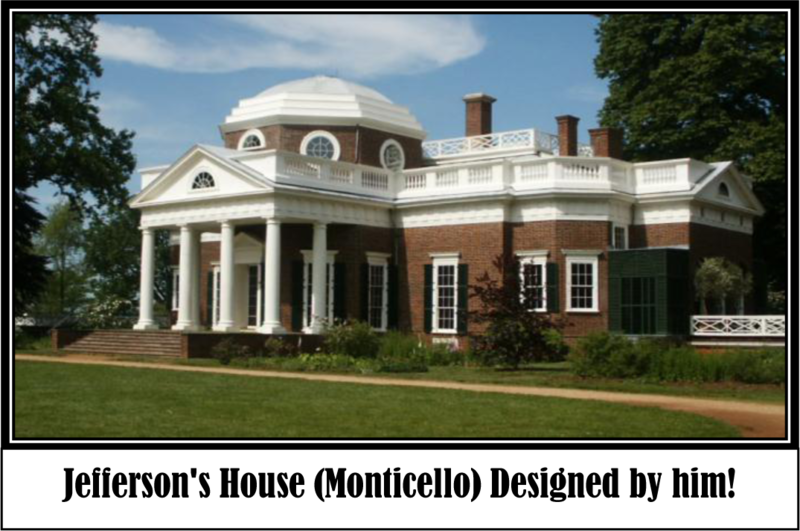 Jefferson’s House (Monticello) Designed by him!At first they had no idea what they were. broken off the heads of the pawns in front of his opponent or the person with whom he was playing. It is easy to picture him saying to an opponent like Franklin “now that we played a standard game, let’s take away a few pawns to make it more fun! But even at our tournaments, parents and kids too tend to look at chess as a game for boys. In families where brothers and sisters play it is rare where the sister will be the better player. Her brothers often will receive most of the parents’ support, especially for becoming a higher level player and even for starting out as a beginner. The real reason for there being so few women Grandmasters can be traced back to when kids first start to play. In a famous 1986 study of why there are so few women at the top of the chess world, Chabris and Glickman show that the answer is in the numbers; boys are starting out at chess in much greater numbers. Though top woman players like Susan Polgar are trying to reverse this trend encouraging more girls to start out with chess through special all girls teams and events, there are similar cultural forces that keep women on a separate track as they get older. Women’s Chess at its highest level is still dominated by players from countries from the former soviet union like, Russia, Armenia, and Azerbaijan. The current US Champion for example is Anna Zatonskih (born and raised in the Ukraine) who just won her fourth US Champion Title two weeks ago in a match against Tatev Abrahamyan (born and raised in Armenia.). Though these and other top women players now live in the US, their country of origin is very important. Culturally, the countries of the former Soviet Union have more traditional views of men and women. If your opponent castles first Kingside, you might want to castle queenside so you can use your pawns to attack your opponent’s king without weakening your own castle. If you plan to use pawns to attack, castling on the same side as your opponent can be costly as you must convert your pawns from a defensive role to offensive soldiers. These three basic ideas are a good beginner’s foundation for understanding the Queenside castle. Try them out, you will begin to see that sometimes the extra effort of the Queenside castle is well rewarded. There was no feminist movement on a national scale in these countries that was like the movement in this country in the late sixties and seventies. They are therefore used to the traditional attitudes towards women that support a separation for women at chess’ professional level. With cultural forces keeping girls from starting chess and others keeping them from being equal at the top levels, what is a good solution? Perhaps encouraging separate girls events can help bring in greater numbers of girls to the game. However, once they climb to higher levels they should be allowed to compete equally. Even more than winning, how to lose is critical for kids to learn. How to learn from mistakes is a lifelong lesson we can help impart to them by playing a real game at the level you hope someday they will achieve. As soon as kids start playing in tournaments they hear about “ratings” or how players are assigned a number which shows their relative skill level. 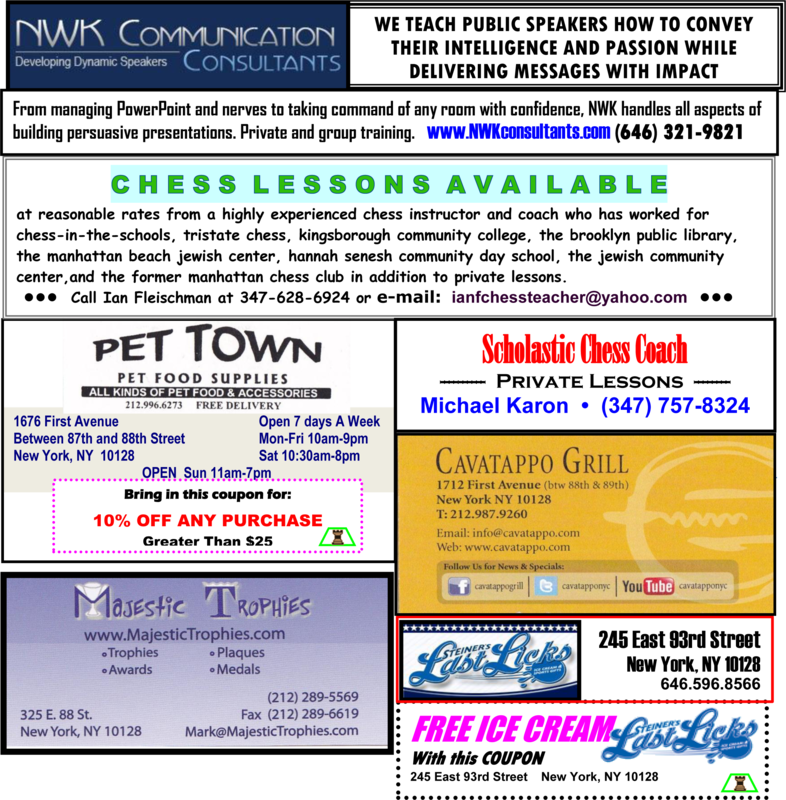 When registering for Tri-State Chess tournaments, you also deal with ratings even if it is just to understand that you don’t have one yet when figuring out in which section you will play. 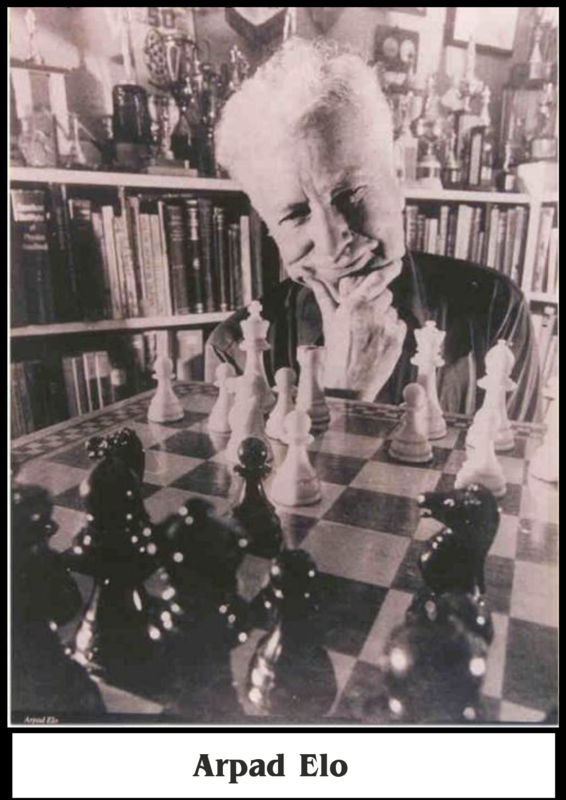 The modern rating system is about 50 years old and was created by Arpad Elo, a physics professor who had a passion for chess. Elo’s system known as ELO rating, is based around the simple idea that two players with the same rating that play many games will each win ideally half the time or 50% of those games that are not draws. When players ratings differ this 50% win rate changes and in the US, when the better player wins ~91% of the time the rating change is set at 400 points. For example, a player rated at 1100 should win 91% of his games with a player rated at 700. 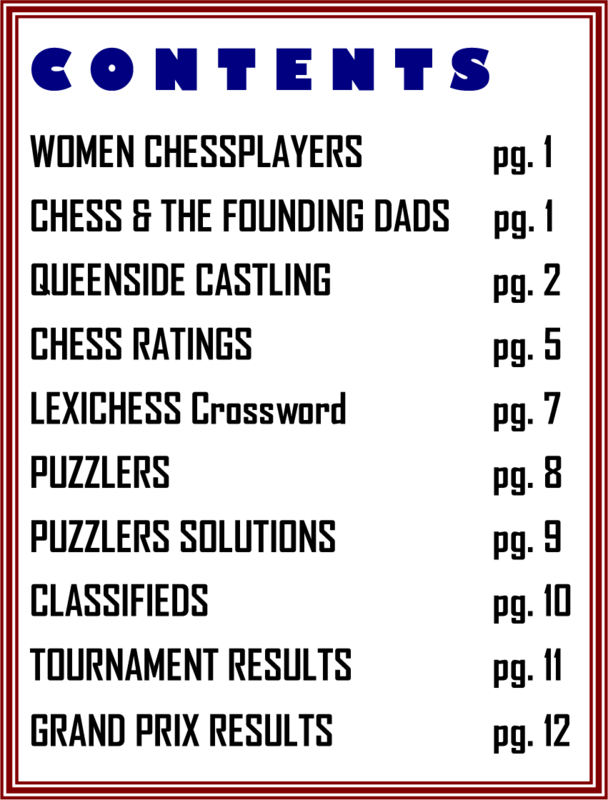 For regular chess tournaments [not Blitz or Mail (correspondence) chess], the US Chess Federation calculates two types of ratings, “provisional” for a players first 25 games, and after 25 games “established” ratings. As most of our players have questions on their initial ratings and 25 games covers six tournaments (four games/tournament), we will focus on the detail for “provisional” ratings. 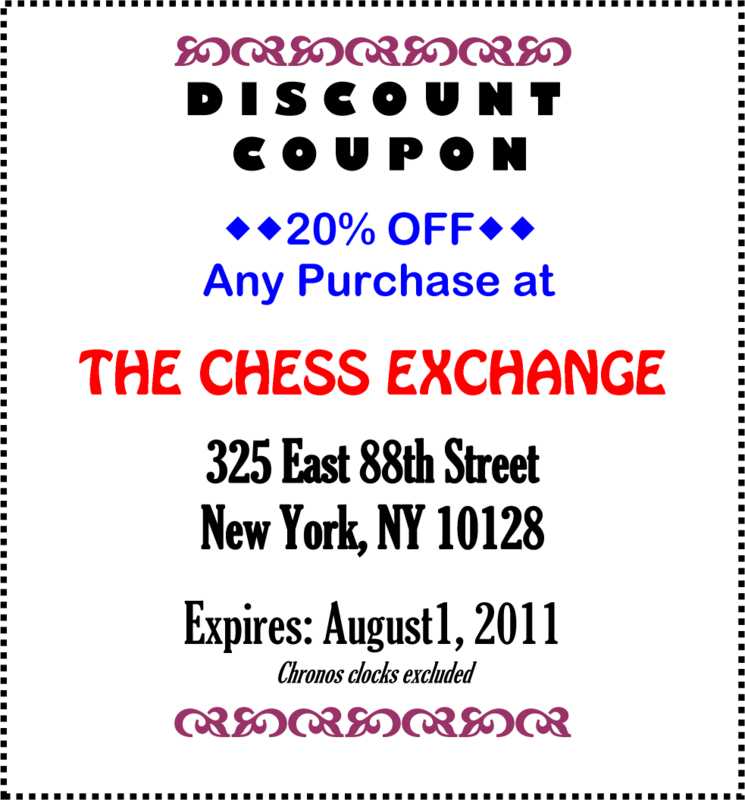 Established ratings are calculated in the next issued of The Chess Exchange newsletter. Ratings in chess range from about 100 for real beginners up to 2500-2800 for the most advanced players. Higher level players are also awarded titles by FIDE the international chess association. Players with a 2500 rating for instance, are eligible to apply for the Grandmaster title which also involves playing successfully in special tournaments with other grandmasters (norms). In January 1990 Kasparov achieving the (then) highest FIDE rating ever, passing 2800 and breaking Bobby Fischer’s old record of 2785. On the July 1999 and January 2000 FIDE rating lists Kasparov reached a 2851 Elo rating, the highest rating ever achieved. There was a time in the early 90s when Kasparov was over 2800 and the only person in the 2700s was Anatoly Karpov. According to the unofficial Chessmetrics calculations, Kasparov was the highest rated player in the world continuously from February 1985 until October 2004. He also holds the highest all-time average rating over a 2 (2877) to 20 (2856) year period and is second to only Bobby Fischer’s (2881 vs 2879) over a one-year period. 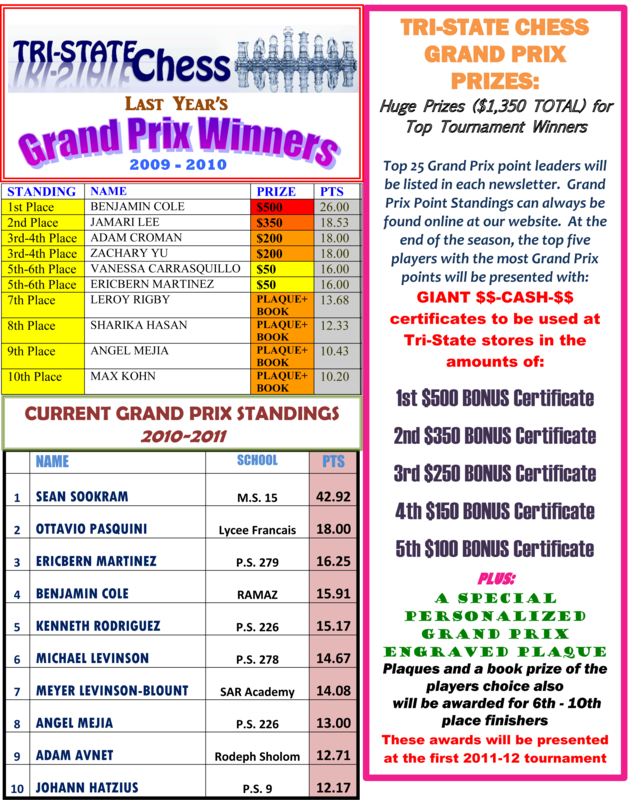 To promote tournament chess in the New York City area, Tri-State Chess will introduce new ¡§Grand Prix¡¨ prizes where top 5 finishers in ALL sections of Tri-State Chess tournament receive special “Grand Prix” points. If players are tied in rank they will evenly split the total points for the tied finish. For example, three players tied for first would split the total points for 1st-3rd place (20) and each would get 6.7 points.